Today's design is different and interesting. I was spending some time Googling different decades, mostly patterns, and came across a very cool image. The minute I saw it it couldn't stop staring. I thought it looked like some cool abstract you would see hanging in someone's 1940s living room. I started thinking about how I could recreate it. I am not talented enough to copy the people in the image but I have gotten really good at lines! I started with two coats of Bettina Clouds. This is the first time I used Clouds and I am in love! It has a white jelly formula, however it only took two coats! It is gorgeous! I added my first set of lines using Barry M Grey. I used Barry M Mango for the orange. And Blood Orange for the red. For the bright teal, I used NOPI Teal Me Something New. Helpful tip - I cut down a striping brush to a few bristles in order to create the thin lines. I love how different this design is! It has the inspiration from the pattern and a newness of its own. Best part, is that it super easy to create! 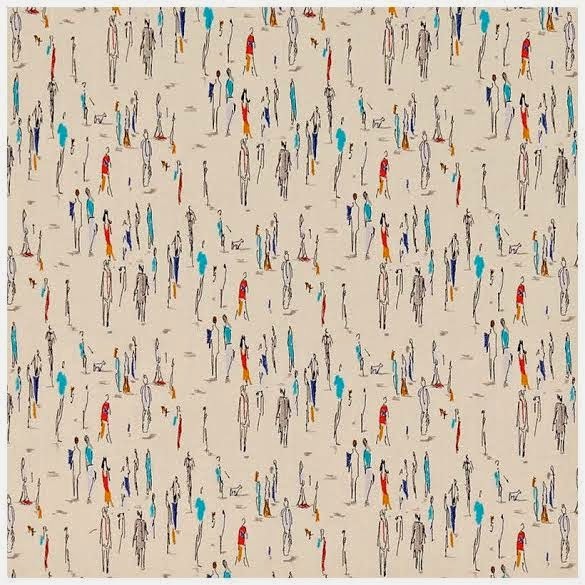 Even though I have called this 40s abstract, I discovered that it is actually a 50s British pattern called Park Life. I think it fits in both decades! I really love this. And desperately need that pattern on something... I just don't know what yet. What great inspiration! That's a fun design. Brilliant conversion from the original image. Very creative interpretation of the pattern. It is so funny - I saw that pattern on cloth and drooled over it. It was on either linen or cotton, and the people were machine embroidered on. Fantastic material. Thanks for the beautiful photos, and the walk down memory lane! I am really in love with how you did this. I would never think to try this out on my nails - but you've really managed to make it artsy! Oh my goodness! These are so gorgeous! I love it! I absolutely love this. The finished manicure is beautiful, and I love how you can totally see where your inspiration came from.